Worries over a short-term growth slowdown took shares lower last month. 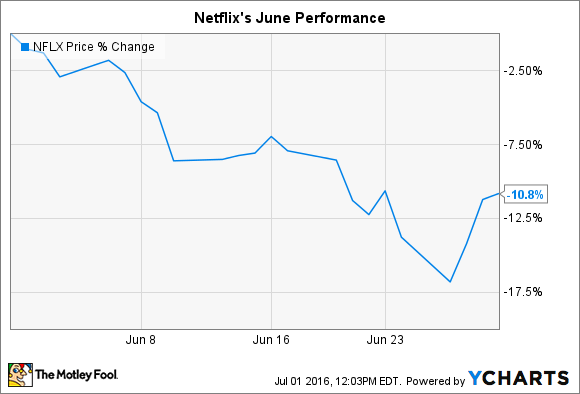 What: Netflix (NASDAQ:NFLX) stock dipped 11% in June, according to data provided by S&P Global Market Intelligence. The streaming video giant is now down 15% for the year and is only barely outperforming the market over the last 52 weeks, rising 3% compared with a 2% uptick for the S&P 500. So what: Investors have been stepping away from stock lately on concerns about a growth slowdown that were not evident in its first-quarter results. Announced in April, those figures were impressive across many fronts. Netflix posted record subscriber gains thanks to additions from a highly successful global expansion. However, CEO Reed Hastings and his team projected that the company will add just 500,000 subscribers in the U.S. market in the second quarter, and only 2 million across all of its international markets. Each of those figures is significantly below the prior year's growth pace, and together they would amount to 24% slowdown overall. There's more at work here than a simple lack of streaming demand. Netflix is pushing through a major price hike on its U.S. members, which should depress growth for a while but is necessary to fund content upgrades. Meanwhile, the international forecast is up against a prior-year period that included a splashy launch in Australia and New Zealand. Netflix doesn't have a new market entry this time around, and so its numbers will look less impressive in comparison. Now what: This month will bring more clarity for investors on the latest operating trends, with Q2 earnings set to post after the market closes on July 18. Because of the especially volatile nature of the stock, a Netflix investment requires a long-term focus. Subscriber growth is critical, but shareholders should be more focused on whether the company is building a deeper moat for its business. Solid returns will ultimately be driven by an improved content offering, better streaming delivery, and an entrenched position across all the major markets around the world. Look for Netflix to make progress on those goals, and try not to let monthly stock price wiggles cloud your investing thesis.